I belong to an online blog community called "5 Minutes for Mom". I pick up some tips and contest info over there and get a fun newsletter from them. They have several sister sites about going green, books, faith, parenting, etc. A new blog just launched called "5 Minutes for Special Needs" and each week she features sites from around the web. Here's her Around the Blogosphere Logo. I contacted the web owner over there and told her about this site. I didn't know if I could be added to their blog roll or not. It's that not fitting in thing again. Here's a blog for special needs and those of us with 2E kids know full well their special needs---but do I really belong on the blog roll next to kids with terminal illness, life threatening illness or even other kids with full blown autism? I guess I get that 'red-headed step-child' feeling a lot of the time...even in cyberspace. However, the web owner emailed me back and told me clearly and firmly that specail needs are special needs. She featured me in the weekly edition of the Around the Blogosphere post. Check out the post and see what some of the other sites have to offer. This blog started as a true labor of love for me. I seriously had no intentions of starting a blog. I am a born-again, spirit-filled Christian and our belief system puts a lot into faith in God. We believed for Nathan to be miraculously healed for several years. We have prayed over him and for him and have waited on the Lord. Now, I must say that we still believe that God can heal him instantly and I still pray for that, but if I'm being honest with myself (and with you), I've slowed down that particular prayer. I still pray for him to be healed or cured, but I feel that God has put a path before us where He works through the hands of men to help us reach our miracle. I want to make sure that at all times, He is still glorified in my words and actions. It's the path that was before us that led to this blog. I felt nudges for a while leading me towards sharing our story in full and the struggles and challenges we were facing. I have found it to be exceedingly difficult to find parents of 2E children and while there's technical support out there, I couldn't find anyone who was speaking to my heart. There were days when I cried and cried and wondered where other moms were who were going through what I was going through. I couldn't find those moms in my city, I couldn't find those moms online---but oh, I know you are out there. So in some searching for a domain for my family blog, I stumbled onto the name www.coolestchildren.com. I struggled for a while longer before taking a plunge and launching this very site. I spent some long periods in time praying and asking God for wisdom and direction and He led me here. To this blog, this spot in cyberspace where I could reach out. I came to the realization that even if only one person was helped by reading about our struggles, challenges and successes---it would be worth it. Beyond that, I decided it was really healing for me to share some of the struggles I've gone through for seven years and have generally shared with nobody beyond my husband. My family knew more of what our days were like, but it was too painful and too difficult to share the bulk of this 'stuff' with my closest friends. They didn't have the same struggles and who wants to sound like a whiner? Now, at last, we are here. I'm still working to balance this blog and reconcile it to my own life. That's why posts are a little slow in coming right now. I've had to deal with these issues and get to a point where I can share and be open and transparent with you. I purposed in my heart to be real on this blog. Most of all, I want to praise God for what He did with this site. I received several emails the first week from moms who 'got it'. These are the moms I was searching for all these years. They knew what it was like and several of them described my home life while telling me about their children. I pray that we continue to get the word out. I pray that we continue to support and share with each other. I want the world to know about these incredibly bright and brilliant people who are 2E. The Daily Beast has a new article posted about the seeming lack of emotions in many autistic people. I wanted to post it here to let people know of this new theory. While Nathan doesn't have the emotional detach, he pulls away at times. The thing I found the most facinating stuck me about 2E kids. If a Twice Exceptional child experiences 'more' of his/her senses, why is this theory so radical? I don't agree that every Autistic/Aspie child who is detached is super-charged emotionally, but I agree we often brush off these kids when really they are so over sensitive that we don't realize it. Enjoy the article--I know I did. Schwarz notes that nonautistic people, too, “are rather lousy at understanding the inner state of minds too different from their own—but the nonautistic majority gets a free pass because if they assume that the other person's mind works like their own, they have a much better chance of being right.” Thus, when, for example, a child with Asperger’s talks incessantly about his intense interests, he isn’t deliberately dominating the conversation so much as simply failing to consider that there may be a difference between his interests and those of his peers. A few weeks ago, we traveled to Ft. Collins, CO (1 hour North of Denver). It was really simple to fly into Denver, and drive to Ft. Collins. We met with Megan Locke at Able Kids Foundation. She's been trained by Joan Burleigh (you may have read about her in Temple Grandin's book, "Thinking in Pictures: and Other Reports from My Life with Autism"). It's a highly specialized audiological testing process that looks at how the person hears in the three levels of the brain. Nathan was determined to have a Central Auditory Processing Disorder (CAPD). We've suspected this for a long time, but she gave us confirmation. We've heard that many 2E kids hear better than others. She said it's they hear noises down to a level that most people can't. He heard tones down around 0 decibels. Some of these kids have a larger than normal range in the frequencies they hear. Nathan didn't necessarily hear more frequencies that a 'normal' person would, but he can her sounds down at 0 decibels which most people can't hear. The Able Kids Foundation is the only place in the world where you can get an ear filter (if you qualify based on the audiological testing). 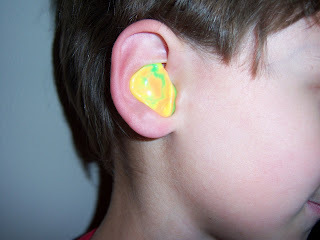 Nathan qualifies and we've got his ear filters ordered. We didn't get the best mold of his ear and the first one didn't fit well, so we're taking more impressions and having another one created. 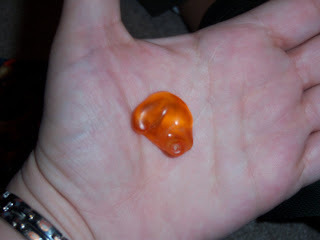 Here are some pictures of his ear filter. 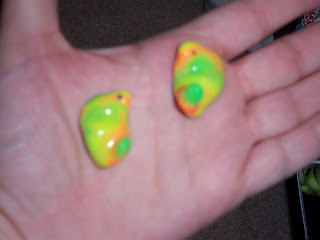 He could chose a variety of colors (including clear), but he wanted orange. No talking him into clear so it wouldn't be noticed. He wants to tell the kids about his super-powered hearing. 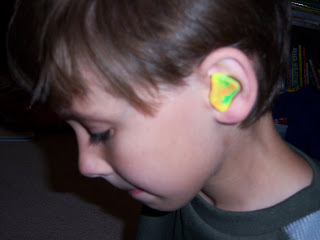 The filter helps filter out high frequency noises--background noises--out of the non-dominant ear. His right ear is dominant and left is not. When she tested him in a silent room, he got 100% accuracy. When Dr. Locke added the background noise of 25 silent students (that's clothes rustling and projector fan running), Nathan's score went down to 71%. When the filter was added to his left ear, he came back to about 94%. With FM Headphones and a microphone on her, he was back to 100%. We now understand more of what we've been told all along about CAP disorders. He hears so well that background noises that we don't hear can overwhelm him. 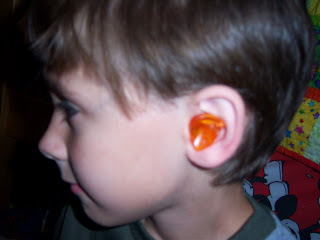 We also ordered custom earplugs for him to wear while doing 'silent work' such as reading, taking tests, working at his deck when listening is not required, etc. These will also be used for swim lessons to keep water out of his ear and to help make the indoor pool environment quieter. We've learned that many kids with CAPD don't like swimming because there is so much background noise, they are totally overwhelmed by sound. Dr. Locke even provided recommendations to be added into Nathan's IEP. Since school is almost over, the teacher agreed to make classroom modifications without trying to add to the IEP. We'll add Dr. Locke's suggestions this fall when we renew Nathan's IEP. I found it interesting where Nathan's challenges lie. When she split words and put high frequency sounds in one ear and low in the other, he couldn't identify any of the words. They even went over the entire list prior to the test so he had seen and heard each word at least once. They use complex words, but her simple example to us would be the word 'cat'. She puts the C-T sounds in one ear and the A sound in the other ear. Our ears should deliver the sounds at the same time into the brain and we know it's CAT. Nathan's ears don't deliver the sounds at the same time so he might hear AT and be asked to guess what that word is. Or perhaps background noise has him hearing A and guessing. She suggested much of his classroom frustration might come from not hearing (and understanding) instructions. She said that when coming in from recess, a teacher might say, "Put your bag in the closet and sit down." His ears deliver that message as, "You're bad-in the closet and sit down." He's confused because he doesn't know if Nathan is bad or some other kid is bad. Should he sit in the closet? None of the other kids are--they are going to their desk. So he will try to sit at his desk and hope he doesn't get in more trouble...only to be told that he didn't follow instructions because he sat at his desk with his bag. 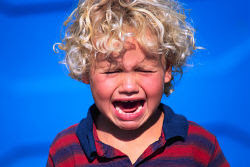 And we often have wondered why he cries so much at school! We were pleased with what we received from them and would encourage others who have children with CAPD or suspected CAPD to look into this. It might not be right for you, but at least you are now informed that it's out there.